"This bridge will not be gray!" Dave Eggers takes readers on a journey of how the Golden Gate Bridge came to be the landmark it is today in This Bridge Will Not Be Gray. Written in both a no-nonsense and lighthearted style, Dave Eggers quickly has readers scratching their heads as to the main demographic for this book. Since it's a picture book, is it for children? Or is it a picture book for adults? The 100+ pages make it even more difficult to discern just who this book is for. Its lengthy number of pages, however, don't feel cumbersome or unnecessary. Tucker Nichols' illustrations are equally unusual for a book of this subject-matter. Normally a book that deals in historical facts has somewhat realistic illustrations. Nichols, instead, uses overly simplistic cut paper illustrations. In same page-spreads, it seems like a natural fit, but in others, I longed for more detail. In addition, I found myself, just as others have criticized, finding Eggers' use of repetition to be a bit pretentious at times and also wishing for some backmatter like an author's note and/or timeline at the end. 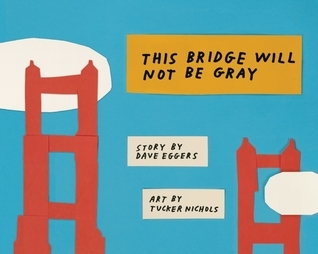 Despite those criticisms and head-scratching that is sure to occur upon first read, This Bridge Will Not Be Gray is an overall enjoyable read and worth sharing with kids and adults alike.